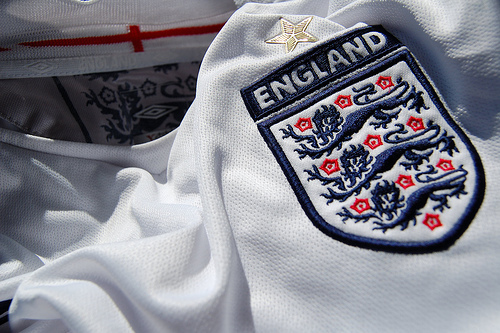 sportsmatrix » Is Roy Hodgson Clever by Picking Tom for England? Is Roy Hodgson Clever by Picking Tom for England? With 100 days to go before the World Cup in Brazil, Roy Hodgson, like all international managers will surely be starting to put the final touches on his World Cup squad. This week’s round of international matches will give Hodgson et al. another chance to run the rule over the various players vying for a place on the plane. In England, one of the players that has dominated the headlines is midfielder Tom Cleverley and his inclusion in the England squad to take on Denmark at Wembley. Most commentators and fans are unanimous in their damnation for Cleverley’s role in Manchester United’s shocking season. Cleverley came out in defence of his role in the team claimed that the making of him the scapegoat for United’s season was grossly unfair. Now opinion and emotion are never good benchmarks for the real picture so we looked at the stats to see what they would reveal. To make it more interesting we also looked at the stats of two other English midfielders who had not been picked for the squad for the game against Denmark – Swansea’s Jonjo Shelvey and Aston Villa’s Fabian Delph. Starting from the beginning with the bread and butter of an attack minded midfielder – attacking actions. Out of the three players, Cleverley ranks in the middle of the three players in terms of both quantity and quality. Interestingly, Shelvey far outranks the United man when it comes to good attacking actions. When it comes to creating chances per game, Cleverley is again between the two players although the number of chances created is significantly behind Shelvey and slightly behind Delph. Shelvey is the stand out player in this regard with more than double the number of attempts than both the other players. When it comes to actual chances created. He also manages to create 1 chance per game – something that Cleverley only manages, on average, to do every 5 games. As for individual skill, Delph is the stand out player here both in quality and quantity. Cleverley undertakes less dribbles than Shelvey but his are a higher quality than the Swansea man. In a previous post we discovered how Manchester United have crossed the ball more often than any other team in the Premier League this season, but despite this, Cleverley actually crosses the ball considerably less than any of the three players examined. In fact, he only crosses the ball, on average, every 2 to 3 games. 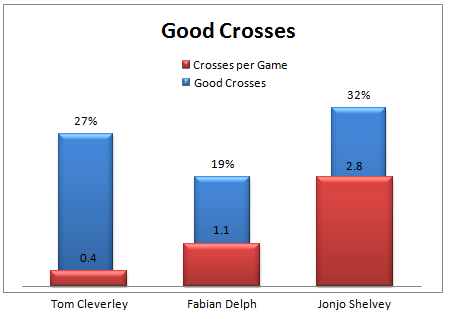 Shelvey, yet again, far outstrips the other players both in number of crosses as well as the percentage of good crosses. Shelvey also gets more shots on goal per game than both Cleverley and Delph combined although, Cleverley does have a slightly higher rate of shots on target and shots that are dangerous. Delph is, by far, the weakest player in this department. As a midfielder, you are also required to help out in defensive duties and here Delph tops his fellow Englishmen. 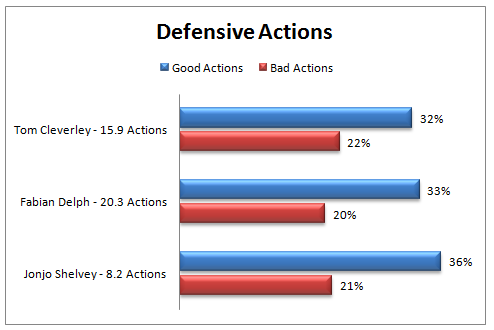 There is not much to separate the three players when it comes to good defensive actions and bad defensive actions. As we can see from the above information, Cleverley should be a very worried man as there would be complete justification, based on the stats, to include Shelvey in the full England squad at the expense of the United man. « Where in the World is Mesut Özil? I would contest the classification of Delph as an attacking midfielder. Hi! Thanks for the comments. How would you classify Delph? Our reasoning was based on the fact that he spends, on average, 50% of his time playing in an advanced position, with the remainder spent in and around the centre circle. Delph plays in a fairly deep left central midfield role for Villa. If he was going to be picked it would be for his energy and box to box ability. He is an all rounder and there is definitely no way he can be classed as an attacking midfielder. Hi TJ, thanks for your comments and you make a good point. 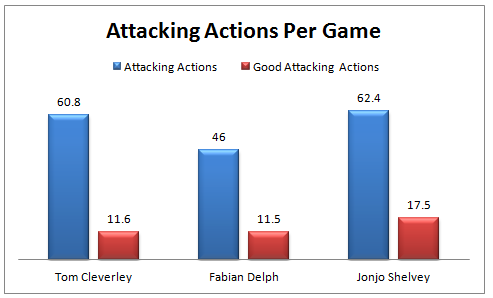 We do believe, based on the stats, that Delph is an attack-minded midfielder. It is quite telling, though, that he creates more chances per game, dribbles more and takes more shots than Tom Cleverley. Yeah I would agree that the classification of Delph as an attacking midfielder is a bit strange. I understand why you might do it, but if you look at Villa’s playing style, and the role he plays, it doesn’t fit. He has played that role a few times in the past, but now he looks like more of a box-to-box guy. He only seems to be more advanced because the other two midfielders are also playing in deeper positions (Westwood to create, El-Ahmadi to break up play) forcing him to move forward a bit more often, I think. Because of Villa’s playing style, he doesn’t behave like a normal attacking midfielder would, though, because Villa don’t keep possession much, or play much through the middle. So I think classifying him as an attacking midfielder probably actually understates his impact on the team, which further underlines how poor a selection Cleverley is, I suppose. Interesting analysis though. I hadn’t noticed Shelvey’s impact. I’d like to think both Delph and Shelvey could get into the England squad soon enough, to be honest.